The singing bowl were originated 26 centuries ago, in the pre-buddhist shamanic BON PO culture of the Himalayas. They were using it in their culture to stop the mind chattering and to go beyond physical body. It gives them visual experiences and makes them travel in other dimensions of life. According to the Big Bang theory, the origin of life is sound and light. Under the surface, we are all composed of frequencies and vibrations. Our chakra system can shift vibrational frequencies to change the experiences of our day to day life. Singing bowls have the ability to put us in to alpha or beta brain waves states, inducing relaxation on the cellular level, allowing us to access a peaceful state of mind and also it brings meditativeness and inducing trance state. Singing bowls can release emotional tensions, stress, insomnia, muscle tensions, sadness and much more. Their vibrations keep us in harmonious state of being and make us healthy and enlightened. It's all in our birth right, we have to make a use of it. Singing bowls meditations is my experience to understand the evolution of consciousness. 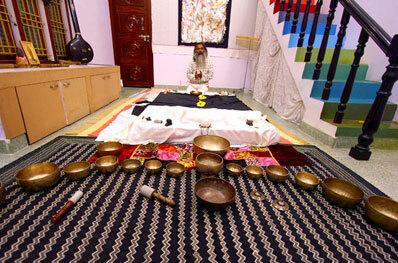 Here I am using the vibrations of traditional singing bowls to awaken the kundalini energy. This dormant energy starts rising, traveling through the spine to the brain. We were born with two dynamic energies. In science, they call it genes of the father and mother. In mysticism, they call it Yin and Yang, Shiva and Shakti. But whatever the name it carries the same significance with it. This is the essence within us. But these dual energies, which we can call left side and right side, or dynamics, can be complimentary or contradictory. While I orchestrate this energy, it actually moves by itself, resulting in the creation of powerful, internal vibrations of the mind-body. Once this energy has reached the two hemispheres of the brain, it can expand into radical state of transformation. When there is relaxation between the right and left side, then each moment we can melt into meditation. In this fusion, the mystical energy starts blooming in us. This is the MANIFESTATION. Once this kundalini force starts flowing within us, again we become a child but with consciousness. Experiencing everything as a wonder. This is the key to existence, a door to KNOW THYSELF. Singing bowls sessions lead you to discover who you really are, give you a new way to look at the universe, make you stronger to face difficulties of life. After one session of 90 minutes, you feel deeply relaxed and feel the change coming. For a deep transformation, 7 sessions are recommended but you can take fewer sessions according to your availability, or more sessions. There is no limit in traveling towards infinity, or in polishing yourself into a diamond.